"The plot draws you in from page to page… An evocation of English history that you can happily get lost in for days." "Remarkable… The first stock market crash in the English-speaking world is about to burst, and a whole way of life is about to burst with it. [An] engaging and multifaceted first novel…"
"Tremendously smart, assured, and entertaining… An intricate mystery, a colorful rogues’ gallery and, improbably, a history lesson on the birth of the stock market." "A vortex of stock fraud and murder… [A] genre-stretching first novel." "An old-fashioned detective story, with London’s teeming streets and taverns as its backdrop… An artfully constructed potboiler: the sort of thing that would make a good ‘Mystery!’ series on PBS." "A tale of eighteenth-century finance, murder, and religion that is a remarkable debut and a thoroughly satisfying novel." 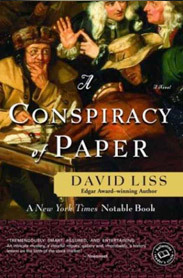 "A Conspiracy of Paper is exciting, intelligent, and witty—a rare combination in historical novels. It is rich in intriguing detail and peopled with fascinating characters. Recommended enthusiastically."